Derailleur hanger Corratec bicycles shop on line. Corratec C-Time 2008-09 derailleur hanger 6061 T651, made with CNC technology. Black anodized. Lighter and more durable than the hanger series. 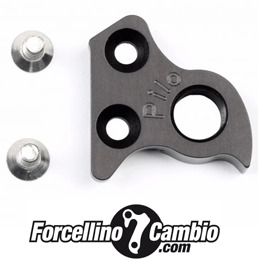 Derailleur hanger for Corratec Air Tech Zone 2013, aluminum 5086 CNC machined Made in Italy. Corratec Dolomiti 2010 derailleur hanger 6061 T651, made with CNC technology. Black anodized. Lighter and more durable than the hanger series. Corratec SuperBow 2015 derailleur hanger 6061 T651, made with CNC technology. Black anodized. Lighter and more durable than the hanger series. Corratec SuperBow 29 2015 derailleur hanger 6061 T651, made with CNC technology. Black anodized. Lighter and more durable than the hanger series. Corratec SuperBow Team 29 derailleur hanger 6061 T651, made with CNC technology. Black anodized. Lighter and more durable than the hanger series. Corratec X Vert Emotion 2006 derailleur hanger 6061 T651, made with CNC technology. Black anodized. Lighter and more durable than the hanger series. Corratec Dolomiti Prosize derailleur hanger 6061 T651, made with CNC technology. Black anodized. Lighter and more durable than the hanger series.